Updates to R. Michael's profile since your last visit are highlighted in yellow. I lived in Phoenix, AZ for about a year after HS, then attended SUNY Fredonia and graduated with a degree in geology in 1986. I bummed around Westfield, content with working in the vineyards until I took a civil service exam and wound up being hired by the NY State Dep't of Transportation in Albany as an engineering geologist. I did that for 8 years, where I became proficient in Geographic Information Systems technology, and took a transfer to another office, where I developed GIS applications for use in transportation-related environmental analysis. After 5 years of that I got homesick and took a transfer to the Buffalo office, where I work as an environmental specialist, overseeing asbestos abatement activities for transportation projects. What about those long, boring assemblies with Bob Mays droning on and on... I hear the principal now is pretty cool, which doesn't seem fair at all. R. Michael Johnston Johnston has a birthday today. 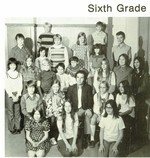 Mr. Fancher's 6th grade class.